I am on the road this week and away from my computer, so I don’t have access to all my usual stuff. Oh well, I’ll try to provide a quick analysis of next Thursday’s auction — a reopening of CUSIP 912810RL4, creating a 29-year, 8-month Treasury Inflation-Protected Security. It auctioned on Feb. 19 with a coupon rate of 0.750% and a yield to maturity of 0.842%, generating the lowest yield for any 29- to 30-year TIPS auction since February 2013. Tick, tick, tick …. This thing was bound to explode. In only four months, the market yield on a 30-year TIPS has risen from 0.842% to about 1.14% today. This TIPS has lost 10 percent of its value, and is currently trading with a price of about $90.09 per $100 of value. The $90.09 price quoted above is from Bloomberg’ Current Yields page, which tracks real-time prices of TIPS on the secondary market. You can watch that page over the next week if you are interested in investing in this TIPS reopening. The Wall Street Journal’s Closing Prices page shows this TIPS closing Thursday with a yield of 1.144% and a wide bid-to-ask spread – centered around $90 per $100. The Treasury’s Real Yields Curve page estimates a full-term 30-year TIPS would yield 1.17% at the close Thursday, down from 1.25% from Wednesday. This TIPS will carry an inflation index of 1.00468 on the June 30 closing date, which will slightly raise the price a TIPS will cost buyers. For example, let’s say the yield comes in at 1.14% and the price is $90.09 per $100 of value. If you bought $10,000 of this TIPS, the inflation adjustment would raise your purchase to $10,046.80, but you would be buying at a discount ($90.09 per $100) so your total cost would come to around $9,051 for $10,000 par. Still, even with the discount, I can’t see this TIPS being a slam-dunk purchase. An after-inflation yield of 1.14% is still very low by historical standards for a 30-year TIPS. But it’s certainly a lot more attractive than the February auction’s 0.842%. Note: If held in a taxable account, the 0.75% coupon rate on this TIPS will make it just barely cash-flow positive over nearly 30 years. You will owe taxes in the current year for inflation adjustments to principal, but you won’t get that money until you sell the TIPS or it matures. Keep that in mind. In the current zero-bound interest rate environment, pretty much any TIPS that can’t be held to maturity is a time-bomb. In the past when rates were decreasing, you could always bail-out on your bonds and still make some money. Going forward, it’s more likely that you’ll be taking a loss. These days you have to assume that any TIPS that you purchase won’t be available for emergencies. iBonds are about the only inflation protected option available that can be used to store emergency cash. You might take a small hit due to the interest penalty. But, at least you know that going-in. With TIPS, it’s totally dependent on the market value. As you’ve shown with your example, this can go south rather quickly. Well that is pretty much the problem with all the nonsense put out by Wall Street and assorted financial advisers. They’ll tell you to take more risk with money you won’t need for 5, 10, 20 years but who really knows that for a certainty? An accident, disabling disease or just being out of work longer than one expected can change things quickly. Then you discover your stocks- or long term bonds- are way under water. There is no long run, just a succession of short runs. Jimbo and Len, I think we all agree that a 30-year investment locked in at 1.15% above inflation looks very risky when for the last 100+ years long-term nominal Treasurys returned about 2% above inflation. I can’t pull the trigger on a 30-year, but if rates continue climbing, 10-year TIPS are going to get attractive again versus I Bonds (held to maturity, naturally). Earlier this week, I popped for a few TIPS on the secondary market. 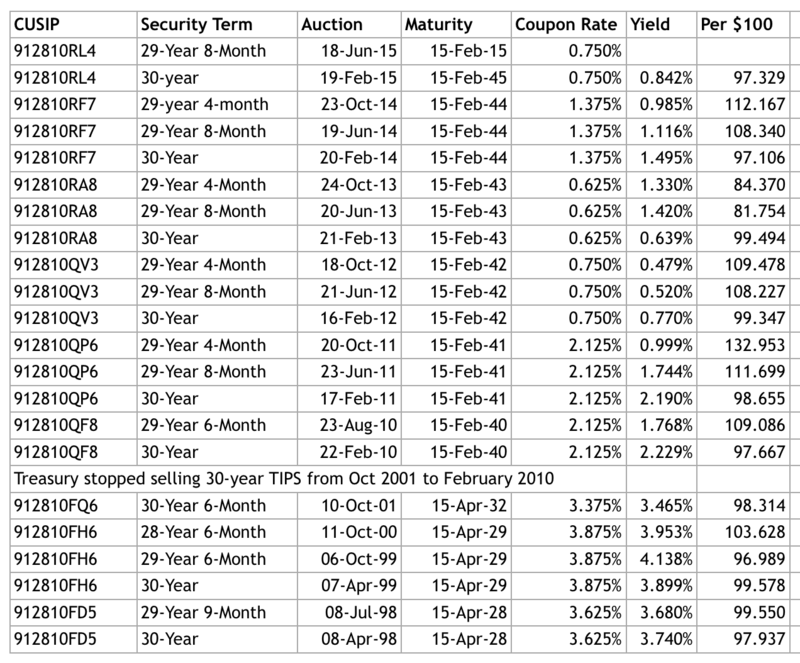 These were for maturities of 8, 9 and 10 years. All of them had an inflation adjusted price under par. Getting yields under 0.5% certainly doesn’t make me emotionally attached to them. That’s about the same yields that was available nearly two years ago right after the taper tantrum. That’s when I started purchasing TIPS. And, it’s been quite an educational experience. Experiencing deflation isn’t merely an abstract concept when you watch the book value of your TIPS go down three months in a row. Since the market value of those same TIPS was up significantly, I just dumped most of those dogs. I just didn’t have the patience to wait for the book value to recover. Now, I’m buying them back at a lower price. Go figure! If deflation comes back and Greece finally officially goes down the tubes, I’ll probably be selling them again. When I started buying back in 2013, I was mentally prepared for the fact that the market value of the bonds was going to go down as interest rates went up. Having lived thru the 80’s, you always have an imbedded fear of inflation. After investing in TIPS I also have a new found fear of deflation! This has also turned all of the iBonds that I have into absolute oinkers. Who’d have thought 2 years ago that those 5 year CD’s that I own would be the best performers in the safe investment category? I still like the concept of inflation protection. But, I won’t be adding to that category until deflation looks like a thing of the past and I can start buying short-term TIPS for under par. I am now pretty firmly convinced the government’s CPI numbers are a fraud, which makes low yields even less desirable. Google: Brett Arends + inflation to see his WSJ article on how the CPI is concocted now. It’s not pretty, and it explains the ridiculously low inflation numbers of recent years for me. For an alternate source try http://www.shadowstats.com to read how the CPI has been altered since the Clinton regime so that it no longer represents… much of anything. Certainly not a “basket of goods” that bears comparison. When you buy a TIPS or I Bond, you are accepting CPI-U as the measurement of ‘inflation.’ It’s the only number that matters. I agree that inflation appears to be under-counted. How is your cash flow doing? My property taxes rise by 5% a year these days. By my calculation, my property taxes have increase about 50% more than inflation over the last 20 years, but my home’s value has increased only about 25% more than inflation. Meanwhile, my salary has been well under inflation since 2007 (journalism, you know how that goes). Having your salary lag inflation certainly makes costs look higher.